By the time you read this I will hopefully be sunning myself on a beach in Spain! Or running around after a four year old building sand castles, collecting water and shells from the sea (continuously and digging holes while all the time trying to keep Kipper hydrated and cool. I can’t wait its been a little while since we have been on a beach holiday and I know Monkeys is going to love it! Being away means that my photo of the week, this week is an old one. 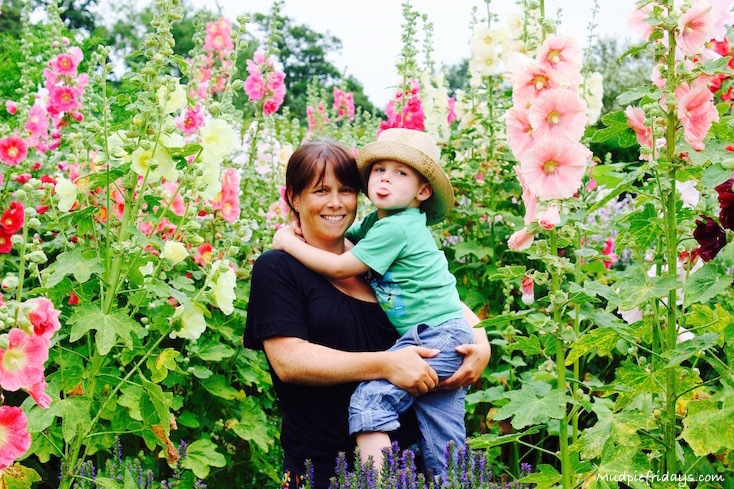 A rare picture of Monkey and me together in amongst the hollyhocks at Loseley Park Gardens. He was not impressed about having his photo taken as you can probably tell with the tongue poking out. The Hollyhocks were amazing, so pretty and giant! This photo doesn’t do them justice as its been reduced in size so it will upload. Its made me want to plant hollyhocks in our garden, I especially like the really dark burgundy ones which you can just see to the right of the shot.